So you can call me crazy or insane and some of you thought we'd never do it - but on our day off for MLK day - we prepped and put into freezer bags 36 meals that we froze and can pull out at anytime post-baby arrival to just toss into the crock pot. First and foremost - shout out to the blog Who Needs a Cape? (or OP for "original poster") for compiling the master recipe and shopping list that put everything together - because wow, I couldn't have done it without her first posting it. If you would like to see her master shopping list, all of her links are on her page! - If you forgo my list and use hers, you will absolutely 100% not need the amount of onions called for. Of the 12 white and 4 red onions - we used 5 white and 2 red. -Print out all the recipes (sorry environmentally friendly people). - If you have a specific time-frame you are saving these meals for (e.g., post-baby) try and start planning like a month or so out, so you can scour sales. Why is my mater shopping list different? On each freezer bag I wrote the name of the recipe, the date the food would be frozen, temp/length in crockpot, any miscellaneous directions so you don't have to look up the recipe again later or if it has a suggestion of what to serve with. For example, "Chicken Tacos. 1/20/14. If frozen, high for 6 hours - if not, should cook in less time. Shred chicken and place back in crock pot for last 30 minutes. Serve on tortillas with sour cream, cheese, etc..."
- While I was going recipe-by-recipe (see below), my hubs took the list I had written about what veggies get "what" done to them and how much, and chopped all of those up. Some people do not mind the mixing of the raw meat and other items because you are going to freeze it regardless - but I had the perfect portion bags, so I opted to use them. So I have no freezer space left? 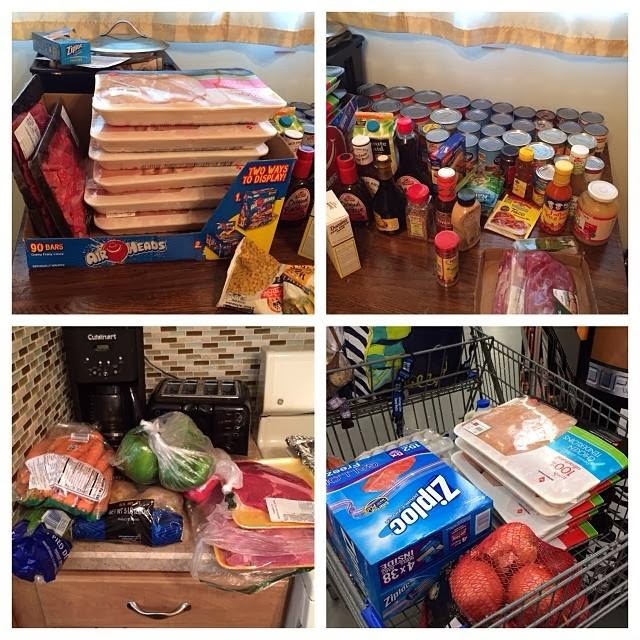 You can find the Master Crockpot Shopping list that I used, along with a suggestion of Pantry Items if you click here. The mission of a "lifetime"?